Report from Administrator Alex Mitham and photos from Alex Cameron (Head of the Southern Oceans Department, in FCO’s Overseas Territories Directorate). Photo left shows Governor-Designate Lisa Phillips alongside President of the Island Council Administrator Alex Mitham with Island Councillors in the Council Chamber on 20th April 2016. At the end of the Island Council meeting, Governor Designate Lisa Phillips very kindly presented the Chief Islander with an official letter from the Duke of Edinburgh. 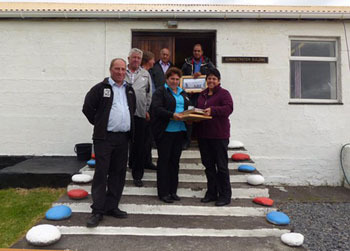 The Duke of Edinburgh has a long standing interest in Tristan da Cunha following his visit in 1957 (the Community Hall is named the Prince Philip Hall after the Duke) and the island were honoured in receiving the official correspondence from Buckingham Palace. The Community look forward to Ian Lavarello, Chief Islander conveying the Duke of Edinburgh’s message on Anniversary Day in August. 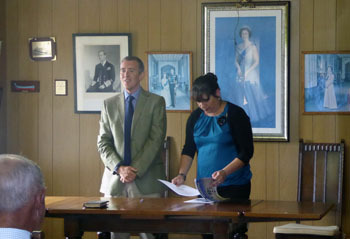 Lisa Phillips also presented the Chief Islander with several photographs of the RMS St Helena and Official Crest. These gifts will be held in pride of place in the Council Chamber. 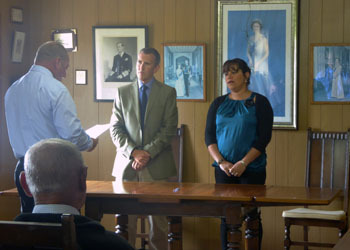 Governor Designate Lisa Phillips presenting a letter from HRH The Duke of Edinburgh to Chief Islander Ian Lavarello. 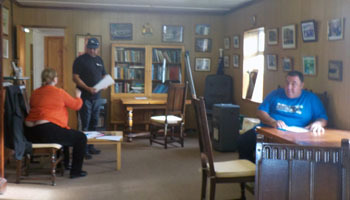 Other Island Councillors pictured are, left to right, Terence Green, Paula Swain, James Glass, Iris Glass, Warren Glass, and Harold Green. 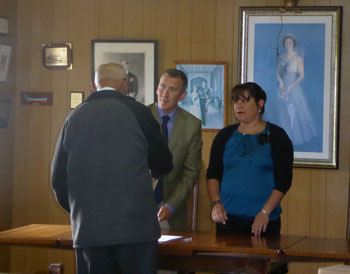 To Ian's right is the President of the Island Council, Administrator Alex Mitham. 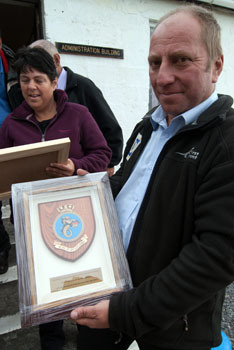 Right, Chief Islander Ian Lavarello with the official crest of the RMS St Helena to mark the vessel's last call at Tristan da Cunha. Front: Sarah Glass-Green, Emma Swain, Iris Green, Paula Swain and Harold Green. All three islanders who have served for three terms as Chief Islander are on the new council: Harold Green, James Glass, and the present Chief Islander Ian Lavarello, who becomes the first to serve for three consecutive terms. 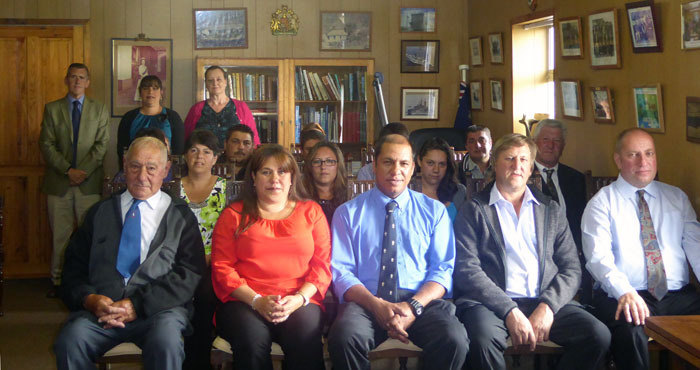 The New Chief Islander and Island Council for 2016 - 2019 were sworn in at the Council Chambers at 17.00 on the 17th March 2016. Ann Biddle as the Presiding Officer and Geraldine Repetto as Council Clerk were also present. After the Swearing In Ceremony the Council and their partners were invited for celebratory drinks at the Residency. 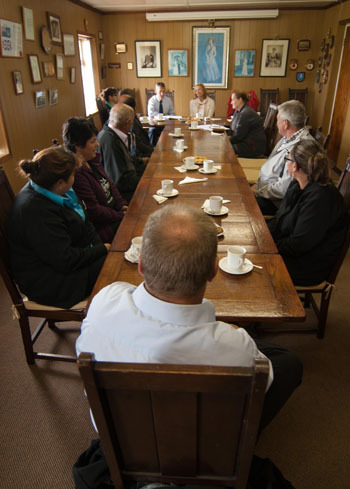 Being Chief Islander or being a Councillor takes a great deal of commitment and courage. The Council sometimes have to take difficult decisions to safeguard the future of the island, and these decisions are not always welcomed by everyone. So I would like to once again thank and congratulate the new Council and Chief Islander on being appointed, and I look forward to working with them for the next 6 months. 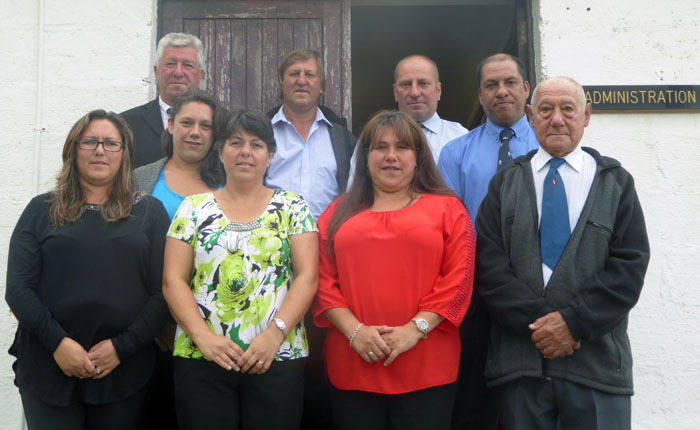 The Tristan Island Council 2013-2016 held its last meeting on 2nd February 2016 and was formally dissolved on 4th February. 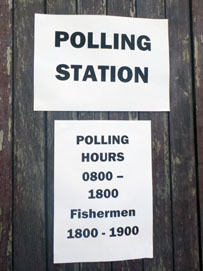 The elections for Chief Islander and Island Council were held on the 9th March, with the Polling Station opening its doors at 08.00. 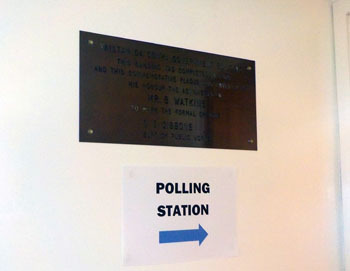 Over 83% of the electorate turned out to cast their vote, and I think that could be a record attendance. (The UK would be very envious of that success!). The doors closed at 19.00 (an hour later than usual due to it being a fishing day). Anne Biddle, Geraldine Repetto, Barry Davies and I counted the votes, and the results were announced to the Governor. I would like to thank the entire community for such a high turnout at the polls – it was wonderful to see so much interest in the election. 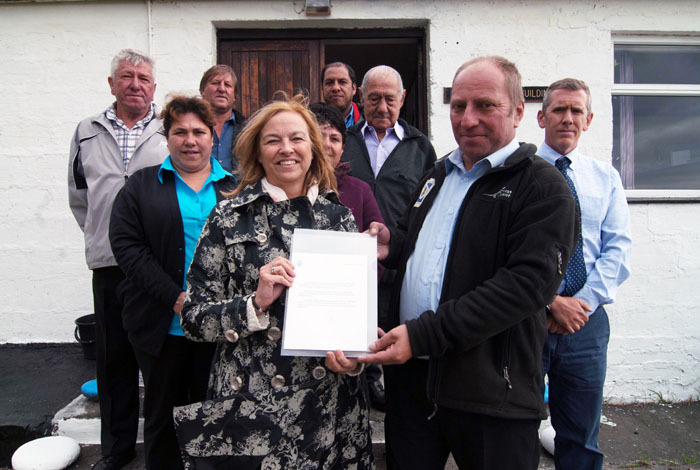 The high attendance showed the islands continued support for not only their Island Council, but also ensuring the community has an active democratic process for ensuring it has a clear and authoritative voice on matters relating to their island. I would like to thank Ann Biddle as Presiding Officer and Geraldine Repetto, Council Clerk who oversaw the Polling Station all day. It was a long, but successful day. I would also like to congratulate the new Chief Islander and Island Council, and I look forward to working with them for the next six months. 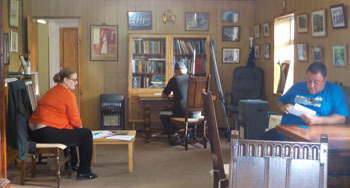 Photos inside the Council Chamber Polling Station with Presiding Officer Ann Biddle overseeing voting arrangements. Ian Lavarello was elected Chief Islander to serve a third consecutive term. 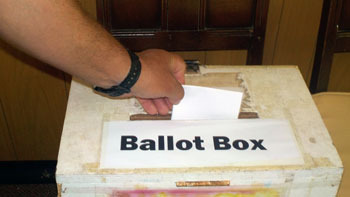 Emma Swain, Paula Swain, Ian Lavarello, James Patrick Glass, Warren Glass, Terence Green, Sarah Green and Lorraine Repetto were elected as Island Councillors. In addition Administrator Alex Mitham appointed Harold Green, Conrad Glass and Iris Green as Island Councillors.